During this year’s Project Isaiah food drive, the Metro Vancouver community donated four months’ worth of provisions for the Jewish Food Bank, which will feed and support the 300 households who turn to the Jewish Food Bank each month. More than 80 volunteers came together to help Jewish Family Services sort the food on Sept. 26, helping unload, box and organize nearly 1,300 bags of food and toiletries. The collection is a huge effort and JFS could not have done it without all of its partners across the Jewish community, as well as the countless individuals who donated and volunteered, and Vancouver Talmud Torah and Congregation Beth Israel who offered the use of their facilities. The number of those who rely on the Jewish Food Bank continues to rise. JFS’s services also include home delivery to seniors and people with disabilities, and the recently launched Jewish Food Link program extends the agency’s reach to serve people in the Tri-Cities and Richmond areas. Lubavitch BC held its 40th Annual Gold Plate Celebration on March 15, 2018. 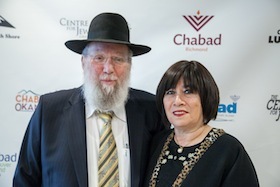 The dinner celebrated 43 years of Chabad Lubavitch service to British Columbia. Instead of having a sit-down affair this year, Chabad Lubavitch BC had a cocktail reception and donated the money raised (the costs saved by not having a sit-down dinner) – $10,000 – to the JFS Vancouver Jewish Food Bank to help those in need. There was also a raffle for the grand cash prize of $18,000. The atmosphere at the Jewish Food Bank on Feb. 22 at the Peretz Centre for Secular Jewish Culture was almost festive. Adults chatted, kids played, as people made their way through the various lines. 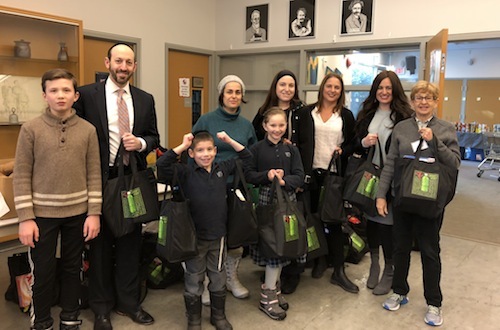 Vancouver Hebrew Academy students had already come and gone – having delivered more than 200 mishloach manot packages in anticipation of Purim – and Minister of Justice and Attorney General of Canada Jody Wilson-Raybould had stopped in to visit. All of the items provided in the 200-plus mishloach manot gift bags were donated by two Real Canadian Superstore locations: Marine Drive and Grandview. “And they have [donated] for several years now,” said Pacht, stressing his gratitude. In years past, the initiative has included other Jewish schools – Vancouver Talmud Torah, Richmond Jewish Day School, King David High School, Pacific Torah Institute and Shalhevet Girls High School – and “was an avenue to raise funds for all of the Jewish day schools,” said Pacht, as people donated to have Purim packages sent to friends, family and colleagues. Run under the umbrella of VHA, it was the “Vancouver Jewish Day Schools Purim Project,” he added. 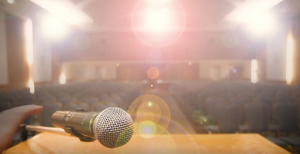 “In past years, we have hosted the event at KDHS and had students from all the schools participate in various capacities,” explained the rabbi. “VTT, VHA and RJDS students packing, KDHS students setting up and cleaning up, PTI and Shalhevet students picking up items from Superstore, etc. We also have had parents from all of the schools volunteer their time to assist the packing process and deliver the packages on Purim day. VHA also sent out “a mailing containing a Purim kit, with some information about the holiday and a few practical goodies as well,” said Pacht. Each year, Jewish Family Service Agency, in collaboration with Jewish Women International-B.C., operates Project Isaiah – a High Holy Days food drive that assists members of our community in need. A successful response to Project Isaiah is vital to provide 300 people in the community with four months’ worth of provisions from the Jewish Food Bank. JFSA is grateful for the assistance of local synagogues in distributing bags and collecting items from congregants for this special project. 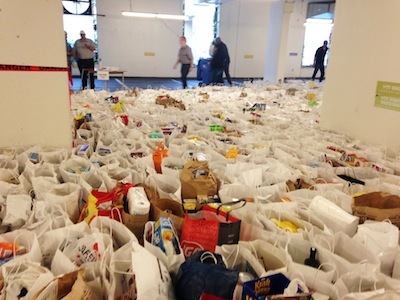 The bags are distributed in September and JFSA asks that people pick one (or more) up, fill it with non-perishable food and return the full bag(s) to their synagogue or wherever they originally collected the bag(s). All donations go directly to the Jewish Food Bank to assist individuals and families. For more information about Project Isaiah – “… share your bread with the hungry” (Isaiah 58:7) – contact Marnie Greenwald at 604-257-5151, ext. 1-230, or [email protected]jfsa.ca, or Sara Ciacci at 604-325-4810. Visit jfsa.ca/donate or call 604-257-5151 to make a direct donation, or buy a Rosh Hashanah tribute card, to support JFSA’s food assistance programs or any of its other funds. “Something that we never could have imagined to be possible eventually became a reality because of our continued dreams,” said Beth Israel Rabbi Jonathan Infeld, referring to the establishment of the state of Israel, the 69th anniversary of which took place on the day he addressed the 13th Annual Jewish Family Service Agency Innovators Lunch. JFSA’s capacity was strengthened by the success of the May 2 lunch at Hyatt Regency Vancouver, which featured Kiva founder Jessica Jackley as the keynote speaker. After three years of declining donations, the 2017 event set a record – $340,224 has been raised from the lunch to date, writes JFSA chief executive officer Richard Fruchter in the agency’s May 24 enewsletter. The Edwina and Paul Heller Memorial Fund helped this year’s total by matching new gifts and any increases in renewed gifts to the event, up to a total of $25,000. Co-chaired by Dr. Sherri Wise and Shannon Ezekiel, the lunch began with a welcome from Karen James, chair of JFSA’s board of directors. Fruchter then provided an update on the varied activities of the organization, including the services they offer the non-Jewish community. “We strive to make a difference for each and every person who walks through our doors,” he said. This year’s short video shared the stories of a few people who JFSA has helped, including that of a young man struggling with anxiety and depression who received counseling at JFSA and a couple who received help finding needed subsidized housing for seniors. It also focused on the story of Tea and her father, Zadik. At the lunch, JFSA board member and development chair Jody Dales told the audience of more than 600 that one of her and her husband’s main concerns is alleviating poverty, and that’s why they came to work with JFSA. She spoke about the importance of JFSA’s services for seniors with low incomes, and noted that this group includes Holocaust survivors. She spoke of the importance of the counseling that JFSA provides in a province where waitlists for psychiatrists can be eight months or longer. JFSA spends more than $100,000 a year on operating the Jewish Food Bank and close to $400,000 making food vouchers available, said Dales. In the last few years, she added, the demand for vouchers has almost doubled and JFSA has had to reduce the amounts provided, from approximately $65 per month per individual, to $45. In addition, the agency has had to stop accepting new requests. Approximately five new people or families request to be put on the voucher list each month and all must be turned away, she said. Shay Keil, director of wealth management at Keil Investment Group, introduced Jackley. Kiva, the microloan platform she launched in 2005, allows users to give loans of as little as $25 to entrepreneurs anywhere in the world. According to its website, Kiva has connected 1.6 million lenders with 2.4 million borrowers, facilitating almost $1 billion in microloans, which have a repayment rate of 97.1%. 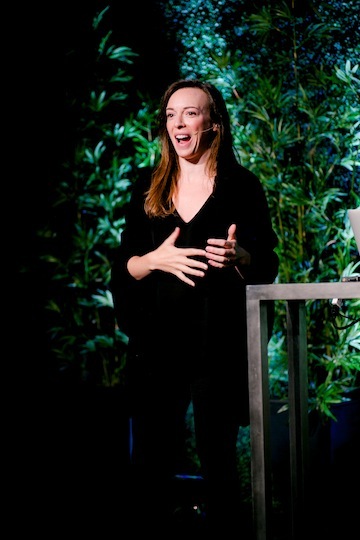 In her Innovators talk, Jackley emphasized her journey from caring for the poor to helping them empower themselves, illustrating along the way how a small idea in social innovation, like Kiva, can grow and have such a large impact. The record revenue raised at this year’s Innovators comes at a time when the demands on JFSA are at record levels. The cost of living in Metro Vancouver, combined with rising food prices, particularly for produce, protein and dairy-based staples, is creating a crisis for many families, Fruchter told the Independent. “In the past year, due to increasing hardship, the number of families having to use the Jewish Food Bank twice a month has almost doubled. Weekly phone calls seeking help with housing have also doubled over the past two years,” said Fruchter, and demand for help from new immigrants is also high. Project Isaiah is the annual High Holy Day food drive that assists those members of the community who are in need. All donations go directly to the Jewish Food Bank to assist individuals in the community – seniors, families and newcomers. • 12 percent of B.C. residents are unable to meet basic needs and do not have access to adequately nutritious food in sufficient amounts. • For the past eight years, British Columbia has been ranked as the highest province in Canada for children living in poverty. • Food bank usage is at an all-time high. • 7.7 percent of B.C. residents are considered “food insecure” and go without or on reduced food intake. The Jewish Food Bank supports almost 400 Jewish individuals. Each time clients visit the food bank, they receive approximately two to three days’ worth of food per individual. All of the households served live at or below the poverty line and 80 percent of all households spend at least 60 percent of their income on rent. All clients are assessed and authorized by a JFSA caseworker. Currently, the food bank helps 55 children and teenagers, 248 adults and 91 senior adults. Annually, more than 45 volunteers provide operational support to the food bank. The volunteers do the ordering, pick up donated goods, set up, as well as deliver to more than 50 homebound clients. With additional volunteers for its annual food drives, Project Isaiah, and the newly established Project Sustenance in the spring, volunteers contribute close to 3,500 hours of support. The food bank is fully funded through the generosity of JFSA donors, the fundraising efforts and donors of JWI-BC, gift-in-kind donations of food through various food drive events, such as Project Isaiah and Project Sustenance, and ongoing donations collected by community partners. This past year, it had an operating budget of $149,200, with in-kind donations of food making up a value of $30,000 of the annual budget. Close to 40 community partners provide ongoing food donations, supplies and space to support the Jewish Food Bank. These partners help lower the cost of operations and play a critical role. This year’s Project Isaiah is underway, and the food bank is hoping that you will consider sharing your bread with the hungry (now and throughout the year). Take a bag home from a local synagogue or Jewish day school and return it, filled with food. A suggested shopping list includes high-nutrition items such as canned fish (tuna/salmon/sardines), peanut butter (plastic bottles only), canned fruit, canned vegetables, cooking oil (plastic bottles only), whole grain pasta/rice/cereals, legumes (canned or dried), dried fruit (prunes/apricots) and toiletries (includes children’s diapers). Note: check the “best before date” on products, as expired products cannot be accepted. If you are unable to contribute food, JFSA and JWI-BC gratefully accept monetary donations (and issue a tax receipt). For more information about Project Isaiah, contact Debbie Rootman at JFSA (604-257-5151, ext. 230) or [email protected], or Sara Ciacci at JWI-BC (604-838-5567).